Air Ambulance charities across the country are once again coming together to celebrate National Air Ambulance Week (#NAAW2018) which takes place this week – from 10-16 September 2018. The UK’s air ambulance charities are funded by the generosity of the public and treat over 25,000 patients throughout the year. Operational every single day, these 21 charities operate 39 aircraft and are deployed to treat the most critically ill or seriously injured patients in their time of need. Across the UK, an air ambulance is deployed every 10 minutes; essentially bringing the hospital to the patient, no matter their location. Many carry and administer blood products which drastically improve the chances of a patient getting to hospital alive, whilst they also undertake a number of critical inter-hospital transfers every year. With many of the charities investing funds to expand their operations, increasing their operating hours to provide night HEMS (Helicopter Emergency Medical Service) missions, upgrading to larger aircrafts, enhancing their medical capability and investing in the advanced education and training of their paramedics and doctors, there is no better time to show your support. 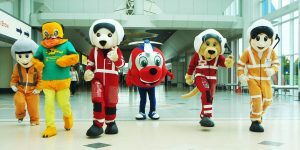 NAAW is an initiative created by the Association of Air Ambulances (AAA) and celebrates the work of local air ambulance charities, giving them a national voice and an opportunity to promote the work they do at a local level.